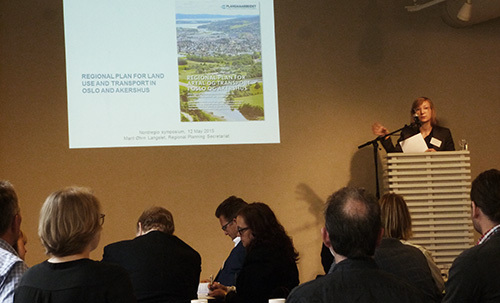 On May 12, city representatives, regional authorities, consultants and researchers came together in the symposium on planning city regions that took place in the city of Oslo. The venue had the objectives of sharing and exchanging experiences of spatial planning at a city regional scale and discussing the challenges and possibilities for urban policy and politics in the Nordic countries, with focus on the added value of a Nordic perspective. Many inspiring and interesting discussions coloured the symposium, particularly one regarding the complex situation that exists in the relationships between municipalities and regions. A Danish representative, for instance, noted that there was a need to “fight for power in different sectors and at different scales” for city-regional planning to be effective. It was determined that there was a greater need for flexible solutions, fluid multi-level governance, and a more widespread recognition of the ‘functional city region’ as a planning norm. The tightly-scheduled agenda consisted of two sessions and two workshops. Experiences were shared from Oslo City Region and the German experiences of metropolitan governance during the first session. The second session included an overview of the challenges and opportunities of Nordic city regional planning and some reflections questioning the ‘urban as a norm’. The insights shared during Sessions 1 and 2 opened into interesting discussions which addressed governance and administrative issues alongside definitions of the ‘urban’ and critiques of how the concept is shaped by today’s urbanization and globalization processes. Marit Øhrn Langslet from Akerhus Fylkes kommune, noted that the Oslo’s rapid growth required a wide-angle ‘functional region’ approach. Representatives from different European states shared conceptions of what the ‘city-region’ should encompass and how city-regions should be supported. Issues relating to city’s growing traffic congestion, urban encroachment onto agricultural land, and climate adaptation required a conception of the ‘Nordic city’ that went beyond tradition urban/rural binaries. Based on the German experience with planning in metropolitan regions, Klaus Kunzmann professor emeritus at Dortmund University explored the (potentially constrained) role that planners have to play in urban regimes where governance is often fragmented and requires strong cooperation. He stressed that: “Planning poetry is not the issue. The challenge is the implementation process” He also pointed out that there is no single model for planning in major urban regions; each region does it differently – however, what is important is leadership. In Kunzmann’s opinion, it is positive that the focus is on city-regions in the Nordic Countries, rather than metropolitan regions – since “a city region is not a big unit, but an ‘archipelago’. Lukas Smas and Moa Tunström, researchers at Nordregio, expanded on these contentions, noting that the ‘city-region’ is not a self-evident concept and stressing the importance of flexible multi-level governance and networking within planning. In the symposium’s second half, social and economic issues came to greater prominence within the presentations. Ryan Weber from Nordregio and Ilpo Tammi from the Council of Tampere Region, utilized a spatial analysis to overlap visual data on service reachability, population, and socioeconomic data, showing that the links between these factors were complex and critically important for planners. Richard Langlais, a researcher in the NorLife-project drew on personal experience from northern Stockholm to argue that the ‘everyday life perspective’ and the ‘lived experiences’ of urban and suburban spaces were essential to crafting productive and socially contingent policy. Richard advocated a greater discussion of planning for more mobile members of society, something that is often neglected in public policy. The workshops motivated more specific reflections, first, regarding the practical tools and strategies used for planning city regions, and second, regarding the everyday-life perspective and phenomena happening outside the planning structure. Discussions were lively and incorporated a wealth of different national perspectives. One representative from Iceland wondered if the ‘urban’ norm had become too dominant in Nordic planning discourse, and questioned whether urban growth in Iceland would essentially strengthen or weaken the country’s rural regions. One planner from Finland noted that issues of socioeconomic equality had ‘lagged behind’ the promotion of growth, and stressed that growing inequalities in Nordic states needed more attention. Danish attendants noted that important data on socioeconomic trends was not available from the National Statistics Bureau, and that power conflicts within different public sectors made planning at the city-regional level potentially difficult. However they emphasized that making quality data and visual tools available, such as the tools presented by Ilipo and Ryan in the Attractive Compactness project, are particularly important to increase coordination and for politicians to make use of it and compare it to other cases. One Danish planner questioned whether the ‘walkable city’ made sense in the wake of increasing commuting away from Danish urban centres. Opinions differed on how much state-level support municipalities should have with local planning. One attendant stressed that there are conflicts of interest present at the local level and between municipalities in city-regions, and thus it is important to have a framework provided from the national level. Some attendants contended that the state needed to provide additional support for housing maintenance and construction, while a politician from Sollentuna municipality in Stockholm was emphatic that government should not have a direct mandate over municipal planning or intervene in local planning issues. Most agreed on that the state should promote collaboration between the relevant stakeholders. In the end, most concluded that city-regional planning was desirable and could be a powerful tool for promoting sustainable growth within the Nordic states. However, the ‘next steps’ for operationalizing the concept remain unclear, and future meetings, such as the Nordregio Forum, could help to clarify what city-regional planning could accomplish for northern Europe’s rapidly expanding urban regions. Moreover, because city-regional governance and planning are issues that concern multiple parties, the challenge at present is to define mechanisms to cope with pressing urban issues while embracing positive competition between Nordic cities. Increased collaboration between local, regional, and state-level actors could create the ideal situation for effective problem-solving on the city-regional scale. This could form the core of a truly ‘Nordic agenda’ on city-regional planning, one that could work on multiple scales to tackle the complex challenges that Nordic nations face. 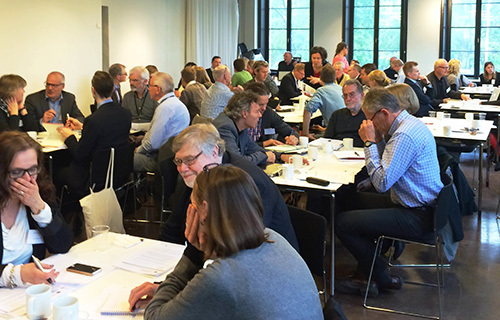 The symposium, hosted by the Nordic working group for green growth – sustainable urban regions, followed up the national meetings that took place in the five Nordic city regions of Copenhagen, Malmö, Oslo, Tampere and Reykjavik in 2014. The venue was also meant to provide additional insights in preparation for the Nordregio Forum 2015, which is Nordregio’s annual event for professionals and policymakers working in the field of urban and regional development in the Nordic countries. This year the forum will have a specific focus on Nordic city regions in a global environment.